Two new books by author MITRA PHUKAN have been released, a fortnight apart from each other! The first is a collection of her short stories, “A Full Night’s Thievery.” The other is her translation of Jyanpeeth Awardee Birendra Kumar Bhattacharyya’s book, “Kobor Aru Phool,” which she has named “Blossoms in the Graveyard.” Mitra Phukan talks to the Managing Editor of “The Thumb Print – A Magazine from the East,” Teresa Rehman, on her two books that look set for the literary long haul. Two of your books have been released, two weeks apart from each other, back to back! Congratulations. Can you tell us more? ‘A Full Night’s thievery’ sounds like an exciting collection of stories. Can you tell us what to expect in this book? 3. 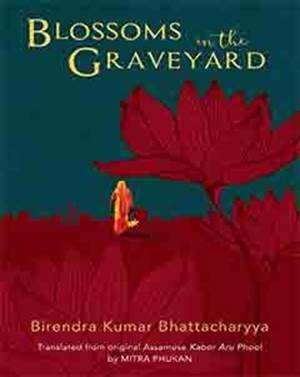 The translation of Jyanpeeth Awardee Birendra Kumar Bhattacharyya’s book, “Kobor Aru Phool”, which has been named “Blossoms in the Graveyard” is another monumental work. Please tell us about your experience as a translator? 4. “Blossoms in the Graveyard” is set in the backdrop of recent history. It’s set in Bangladesh during the war of liberation. Do you think it will help in better understanding of ties between the two countries? The heroine of “Blossoms in the graveyard” is a Muslim girl called Mehr. Please tell us how did you go about understanding the nuances of a Muslim women’s life while translating this book? Do you think these two books will help in changing the usual narrative from this region? As for the translation, when the author herself is none other than such a literary stalwart, it is highly likely that the usual narrative from this region will definitely be modified.